Chester, PA – Postseason accolades continue to file in for No. 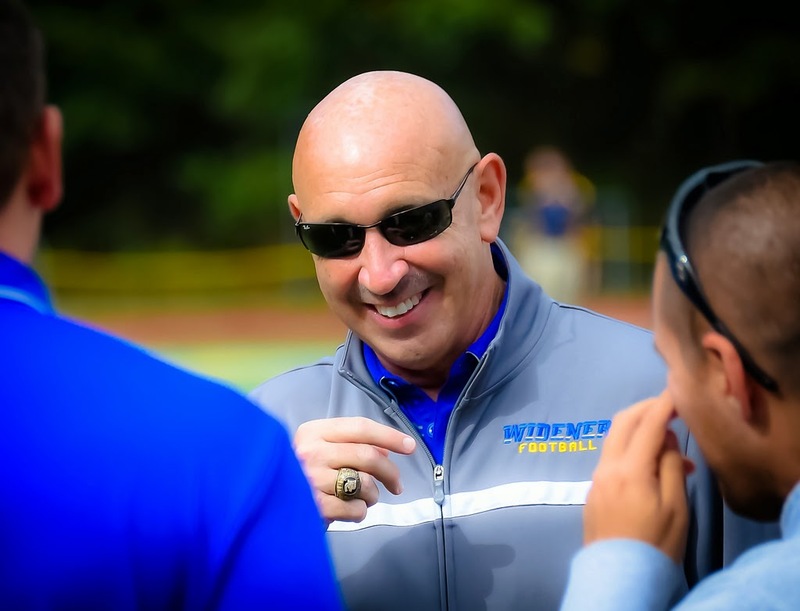 10 football, as Widener head coach Mike Kelly was named Eastern College Athletic Conference (ECAC) South Co-Coach of the Year and several student-athletes were named to regional and national teams. Five student-athletes were named to first team ECAC South All-Star, while another four were named to the second team. Seniors Anthony Davis (Upland, Pa), Brandon Harper (Blackwood, NJ) and Ameer Sorrell (Port Norris, NJ), junior fullback Robert Getz (Kunkletown, Pa) and sophomore safety Sean Titus (Lancaster, Pa) were tabbed first team ECAC South All-Star. Seniors Tyler Glover (Darby, Pa), John DiBiase (Mount Laurel, NJ), and Kevin Burns (Collingdale, Pa) and sophomore Anthony Brooks (Easthampton, NJ) were named second team ECAC South All-Star. Glover, Harper, and Titus were named D3Football.com All-America, while Davis was named to the D3Football.com All-America Honorable Mention. Kelly, Middle Atlantic Conference Coach of the Year, led the Pride to a 12-1 record and a trip to the “Elite Eight” round of the NCAA Tournament. Kelly also led Widener to a league-record 20th Middle Atlantic Conference Championship and their 14th trip to the NCAA Tournament in school history. He won his first 12 games as head coach, the longest such winning and unbeaten streaks in school history. The previous unbeaten run was held by Dutch Sommer, who went 5-0-2, during his only season in 1913. Davis earned his fourth first team All-MAC honor and this comes as no surprise with yet another impressive campaign. He is first in school history with 268 career receptions, 6,767 all-purpose yards, 3,958 receiving yards and 1,840 kickoff return yards. He also is second with 41 touchdown catches and third with 45 touchdowns. He has been voted All-America the last three years and was last year's MAC Offensive Player of the Year. Harper dominated at his post and has been the leader of one of the nation's top defenses. One of the league's toughest to go against either in the run or pass, Harper finished the year with 11.5 tackles for a loss and 6.5 tackles per game. Sorrell can do it all on defense and on special teams. His defense has him 32nd in the country with seven interceptions and sixth on the team with 48 tackles to go with an interception return for a touchdown November 1 vs. Stevenson. Sorrell's work on special teams has seen him return three blocked punts for a touchdown. Getz has been a workhorse in the backfield and has helped create a balance for the offense. He is averaged 16.1 rushing yards per game, 8.8 receiving yards per contest, four touchdowns and 414 all-purpose yards. Titus presence and intuitive play had him finish with nine interceptions for 220 return yards and fourth on the team with 52 tackles. Titus has three games this season with two interceptions and he also returned one 96 yards for a score November 8 at King's. Glover makes the most of his playing time amongst a talented defensive line that is one of the nation's most feared. He finished the season with ten sacks and fifth in the conference with 12.5 tackles for a loss. DiBiase moves up the ladder after getting picked Honorable Mention last season. A determined competitor who is the only honoree for Widener on the defensive line, he has 27 tackles, 7 1/2 tackles for a loss and four sacks. Burns has had a massive campaign at inside linebacker and is one of its key leaders. A threat in any situation much like Harper, Burns finished this season with 22.5 tackles for a loss, ranked first on the team with 98 tackles and also has 4 1/2 sacks. Brooks has been one of many offensive linemen who gave sophomore quarterback Seth Klein and everyone else plenty of time to effectively operate. He was a key component of helping the offense finish with an average 37.3 points per game, 432.4 yards of total offense per game, 270.6 passing yards per game and 279 first downs. Widener finished the regular season at 10-0 for the sixth time in school history. The Pride participated in the NCAA Tournament for the second time in three years, and capped off their 12th undefeated season in school history with a 44-28 victory over Delaware Valley on November 15th. The victory over the Aggies kept the Keystone Cup in Chester for the 25th time in the trophy's 34-year history.